AL HOL CAMP, Syria – She left the Netherlands to become a member of the Islamic state in Syria and married a fighter here. He was killed, so she married another who became pregnant before being killed. So this month, as the Islamic state collapsed, she surrendered with her son to US-backed forces that fought for the jihadists and landed in the sparkling Al Hol tent camp that has swelled to the breaking point with the human remains of the so-called caliphate . "I just want to go back to a normal life," said Jeanetta Yahani, 34, as her son Ahmed, 3, clinging to her leg and shaking with a violent cough. The communication a week ago that the Islamic state had lost its final spot of territory in Syria was a landmark in the fight against the world's most terrible terror. But it also raised urgent questions about the tens of thousands of people flocking to join the jihadists from around the world and now have nothing else to do. Exceptional numbers of the more than 12 million people who lived under the control of Islamic State in Iraq and Syria were killed by the militants or in the fight against them. Camps with some who survived dot Iraq, Libya and Syria, where the Kurdish-led administration in the country's northeastern countries runs three. 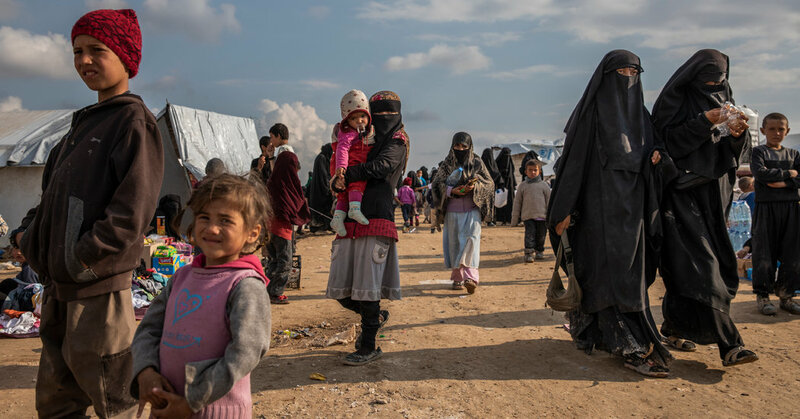 Along with tens of thousands of Syrians and Iraqis, the Syrian camps have 12,000 foreign women and children, according to Redur Xelil, a senior official with Syrian democratic forces, the United States-backed militias fighting for the jihadists. The force also holds more than 8,000 warriors, including 1,000 foreigners, in its prisons. A handful of places, including France, Russia and Chechnya, have taken back small numbers of their citizens, mostly women, children and orphans. But most homelands will not have the caliphate's former occupants back so they are stuck here in a stateless and unstable territory. The local administration lacks the resources to handle them and worries that the lack of international support could help the Islamic state reconstruct itself. "There is little support, little response," said Mohammed Bashir, a camp administrator. This week, local officials called for the establishment of an international court to try foreign warriors, but the idea has received some international support, and the Syrian government is likely to block it. While determining the exact background for the women and the children in the camps, it is difficult, as many lack identification and use false names, they are generally considered less dangerous than the men. But some were also fighters. And some also support the extremists' ideology, which makes local officials reluctant to leave them. Al Hol is the largest of the camps, a scattered, isolated conglomeration of tents on stony ground and surrounded by chain links and armed guards. It held about 9,000 people in December, but when the Islamic State's final territories fell, tens of thousands of people flowed out of those areas. Most were brought to Al Hol, who swelled his population to more than 72,000 today. As the population rose, the camp workers packaged themselves to put enough tents to house them and gather families together to protect them from an unusually cold and rainy winter. But many young children have become ill and some have died. This week, the tenants beat up revolving and broken windows in the administration building before guards fired into the air to dampen them. More than 9,000 of Al Hol's residents are foreigners held in a special section, which The New York Times was rarely granted on Thursday. Even though they were defeated, the women in the camp still follow the rules of the Islamic state, wearing black dresses and facial veil with slits for their eyes. Their clothes were filthy, the shelves and shoes clad in mud. Many toted toddlers with hacking coughs and runny noses. Other kids sold cakes and sodas, their family had managed to introduce or stand in long lines for food, drinking water and gas for generators. Like the ruined caliphate, the camp is international. Groups of women chatted in English, Russian, French, Dutch and Chinese. Blonde and black-haired children played together in the mud. "Are you from the Swedish Red Crescent?" Asked a Swedish woman, trotted after receiving a negative answer. "I am from a country that you do not know, so I will never get out of here," said a woman from the Seychelles. A woman still attached to the jihadists' ideology. A 22-year-old Chechen woman who only identified herself as Um Aisha described life in the Caliphate as "all very good." "There were brothers who believed in Sharia, an Islamic state, and it was not like this," she said, rejecting two female assistants with pants. "Our brothers are everywhere, in Germany, in Russia, in America – we believe that al-Dawla al-Islamia will come back, "she said using the group's Arabic name. A German woman said she had come to Syria with her husband, a doctor. Now she had no idea where he was, and she got stuck in the camp with a baby in her arms and a curly child who grabbed her legs. "I do not want to raise my children in a society that is completely corrupt where every sin is promoted," she said and fell to give her name. It was better to hesitate in Syria, she said. "This is temporary. The afterlife is forever." Galion Su from Trinidad stood close to the camp gate with her face uncovered and hoped to come out and look for her teenage son arrested by Kurdish forces in January. Her husband brought them to Syria in 2014, and the couple divorced shortly and left her struggling to look after her son. "I was like a whore in Dawla," said Mrs. Su, 45. She had married four different men, she said, each on condition that they let her hold her son. When the jihadists tried to force him to fight, she dressed him as a woman and fled, but Kurdish forces arrested him as they discovered the ruse, she said. Now she has no idea where he is. "I just want to be normal and go back to a normal community, sleep in a good bed, eat good food, watch TV and laugh," she said. Children make up about two-thirds of Al Hol's residents. Some are orphans. Many described in detail and with small feelings how their fathers had been killed. Everyone had witnessed violence and some had been taught to practice it. Camp officials say they are too busy to provide tents and food to offer schooling or other activities, much less to deal with people's mental problems or to re-educate children trained by the jihadists. The challenge is intensified because some parents still support the jihadists' ideology. "The mentality is the same. Nothing has changed," said Mr Bashir, the renter. "The children are innocent, but when they end up in the camp, they will learn what their parents are teaching." When the sun set for a rare sunny day over the camp white tents and muddy rubbish bins, group of Turkish boys played a rolling football game, while children from Iraq, Egypt, Russia and elsewhere pelted each other with fistful's gravel. Standing on top of a latrine, an Iraqi boy shouted with a toy rifle: "The Islamic state has invaded!" Training his view of another child, he threatened, "I am a sniper. I shoot you in the head with it same. " Nearly two young children came to a fight and fell to the ground by striking each other, while a 10-year-old boy missing his leg looked at. He refused to give his name or say where he was from, and answered questions with short answers. How do you lose your leg? "Get a tent and stay in it. Or maybe a house."